NBC has renewed The Voice for two more seasons, according to The Hollywood Reporter. The reality singing competition will return in the spring and fall of next year, marking the series' fourth and fifth installments. Usher and Shakira were already set to fill in for judges Cee Lo and Christina Aguilera on the fourth season as the pair take a hiatus from the show. "This pickup will assure the many dedicated Voice fans that this innovative show will continue to bring some of the most talented new voices to the world's attention through all of next year," said NBC Entertainment chairman Robert Greenblatt in a statement. 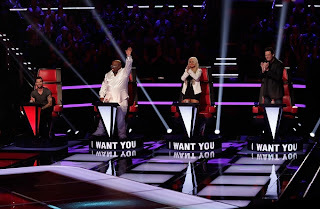 "With the addition of Usher and Shakira as rotating coaches to join Christina, Cee Lo, Adam and Blake in the next cycle, we know that this incredibly addictive program will remain even more relevant as we move forward through this exciting season."